In business since 1998. Call 914 773 6749, via Live Chat or email at Support@econvergence.net to speak with us. "Just wanted to send another big thank you for getting this sent out, against all odds, and to the site just in time for our Grand Opening! "Appreciate the follow up and your great customer service!" 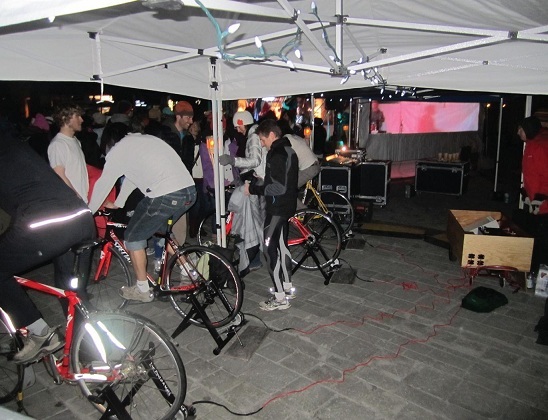 "We are very happy with the Pedal-A-Watt and it served as an excellent demo for clean-power generation on Earth Day. We certainly caught the attention of our employees! We were able to run this Earth Day display for over an hour at lunch just outside our corporate HQ cafeteria"
"I used my Easy Pedal-A-Watt Package during and after Hurricane Sandy to provide power for my heater’s blower, lighting and to power up my iPhone. I was even able to watch a few movies on DVD. It was great because gasoline was not available in our area for about 7 days so my neighbors with generators had no power after about two days as they ran out of gasoline I plan to order another Easy Pedal-A-Watt so we can make twice as much power during the next power outage which could be soon!" Thank you for the great support! Your product is great. It fits all my needs. Thank you again!" 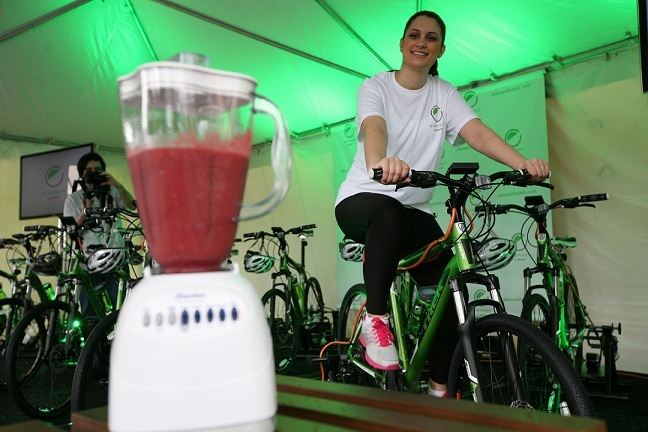 "Nothing but positive feedback and awe about the Pedal-A Watt set up – and the smoothies weren’t too bad either." The Pedal-A-Watt Powering a Computer Server! "I received the Pedal-A-Watt over the weekend and have been able to successfully charge an iPhone." "We got the first Pedal-A-Watt unit this week and it's working great, we're making electricity!" "We at [name removed] all love your product and like I've mentioned before, think that it is a hand in glove fit with our product." "Our concert was great - thanks for your help. 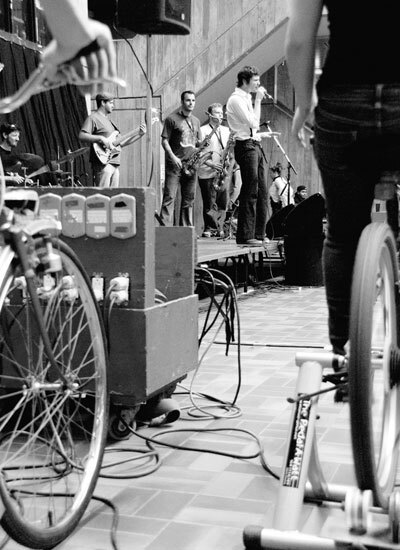 We had 25 Pedal-A-Watts lined up creating power for the sound system and lighting." "We received our Pedal-A-Watt a few days ago. We are very pleased with the construction and quality of it. Thank you. We are what some are calling "preppers", and we meet with the others every Thursday night. 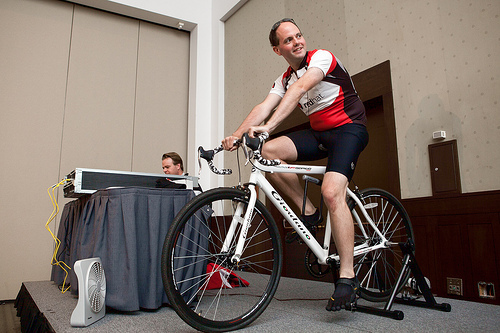 Well, we featured the Pedal-A-Watt at this week's meeting, and people were impressed! It was definitely a winner. Just wanted to say thanks! Charging handheld devices and making healthy juice. "Thanks a lot for shipping the Pedal-A-Watt so quickly, I received it in less than a week. This is definitely going to help my family reduce our carbon footprint. Keep up the good work." "Customers will be able to use the Pedal-A-Watt and compare how much effort it takes to light a row of incandescent bulbs and a row of compact flourescent bulbs. We plan to use this demonstration at a variety of community events to help educate on energy efficiency." "I just checked my mail and to my great astonishment I have a brand new unit. I cannot begin to put in words my appreciation for the best customer service I have seen in many decades. Thank you so much." 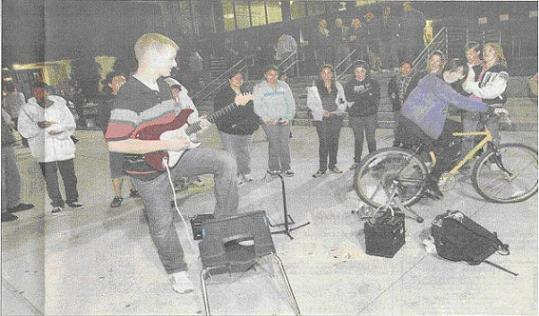 "(Picture below) Josh Nunes, 18, left, on guitar, and Shelby Medina, 17, on the mountain bike, perform in the Renewable Rock band during the family science night at Upland High School Library. 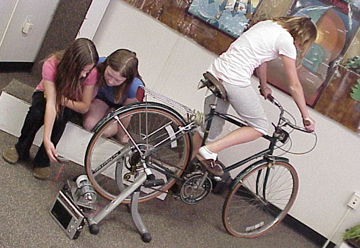 The pedaling of the bike (with the Pedal-A-Watt Stand) creates mechanical energy to power the amp for the guitar to play." 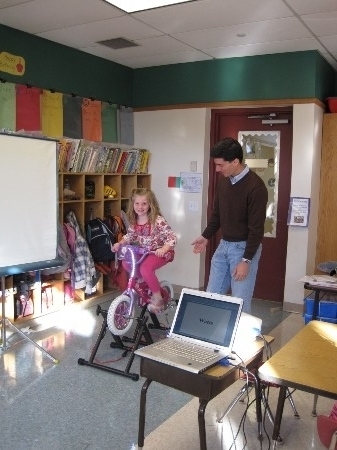 "The Pedal-A-Watt system was a great hit during our Music Festival and Conference! We had it set up in the lobby of the hotel where it powered a laptop associated with the DJ set up." 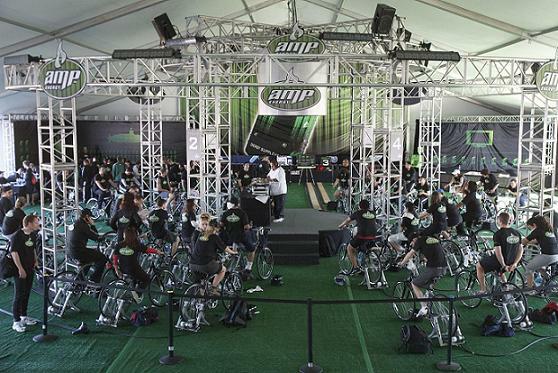 "The Pedal-A-Watt Stands are going strong after two years and many performances." "Our customer that we referred to you loves the system." "I expected good, but it looks even more rugged than I expected. Very nice. I'll set it up this weekend. Thanks." "This is Dan B. from (deleted term) Elementary. 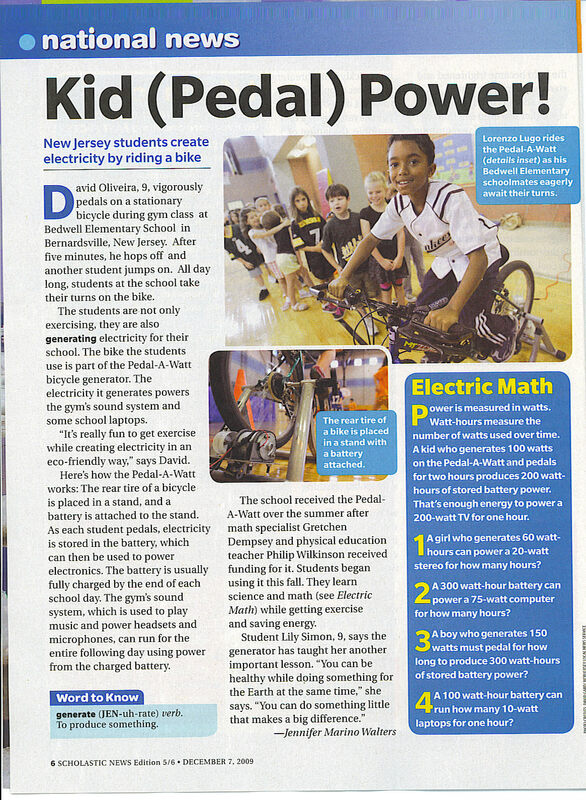 I have attached some pictures (below) of us collecting data on electricity through the Pedal-A-Watt..... Thank you for the opportunity for such a cool interactive tool." "Thank you for the instructions and always answering my number of questions so efficiently!" "What a great product! I didn't even know the Pedal-A-Watt existed. We use ours to provide lighting and power our laptops in our home office. Thanks again for your guidance and a great product." "Dear Convergence Technologies, Your Pedal-A-Watt is the perfect addition to our "green house" demonstration. Visitors get on your Pedal-A-Watt, pedal for a few minutes and then can see how much power they have created by viewing the meter you offer." "The unit came on time and I worked with it at an event the other weekend. Thank you." "We (have used) the (Pedal-A-Watt), it went great! Best wishes." "The Pedal-A-Watt was a great demonstration for our Kindergarten Class. Thank you."